Basic Naturopathy: A Textbook - Life Quest® Formulas, Inc. 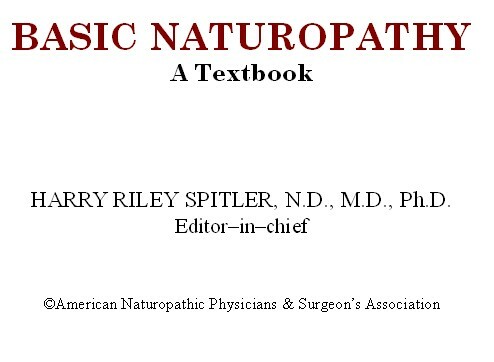 It is with great pleasure that the American Naturopathic Physicians and Surgeons Association, Inc. presents this printing of the textbook by Harry Riley Spitler. Naturopathy was already being pushed underground at its printing in 1948 by imperial allopathic medicine, which, like any religion - albeit in this case, of evolutionary materialism - brooked no competition. By hook and by crook Naturopathy was pushed into the background while allopathic medicine with its loudly proclaimed "wonder-drugs" and improved surgery claimed that they held the Holy Grail of health and long life for all. In 1999, looking backwards, one can only wonder how these Allopaths managed to buy legislatures, engage in dirty tricks, and outright lie about their achievements in order to push Naturopathic Medicine into the catacombs. As one reads this textbook, one can only marvel at the chance America lost for true health and happiness. In our age of iatrogenically caused disease, with its astronomically increasing rates of chronic degenerative disease, new, more potent and anti-biotic resistant viruses and bacteria, health for most Americans is truly a lost dream. In place of allopathic "medical science" which is not "science" at all, but sheer empiricism which changes from day to day - with yesterday's "medical science" today's quackery, and today's "science" the quackery of tomorrow - one may note that truth does not change. The truths, which Spitler expounds in Basic Naturopathy, remain as true today as when he wrote them.